A few weeks ago, I went to pick up my son Caleb at his friend’s house after they spent the morning playing together. They came barreling out the door as I chatted with the friend’s mother. They were slapping each other, kicking, bear hugging and finally falling to ground grappling like tiny Greco-Roman wrestlers. If there was no soundtrack, you’d be worried. But through their screaming, you could hear giggles. If you looked closely, you’d see smiles. Even so, I had to fight my urge to tell Caleb to “stop hitting” or to “play nicely.” For some reason, that day I followed my friend, a woman who has a much more free-range, hands-off parenting style, and said nothing. The whole scene tested my comfort level, but somewhere inside I also felt that this kind of fighting might just be natural and perhaps even good. And I had the nagging sensation that I had witnessed this healthy play fighting before. Then I remembered: my sister’s dogs. If Caleb and his friend had tails, they would have been wagging. And I began to wonder if stopping all this play fighting might possibly be doing our kids a disservice. OK. Yes, yes yes. I do appreciate that, contrary to appearance, our children are not in fact animals and we’d like to socialize them to have some non-canine civility. But it made the anthropologist in me wonder if there wasn’t something deeply ingrained about this kind of play, maybe a human purpose served by it. So, I extensively researched Googled the matter, and my supersleuthing turned up some interesting things. First, this kind of rough and tumble play is pretty much universal. Michael Thompson, a psychologist who co-wrote "Raising Cain: Protecting the Emotional Life of Boys" says, “play, rougher in its themes and rougher physically, is a feature of boyhood in every society on earth.” It's unluckily it would be so universal if it didn't serve some adaptive function. Secondly, aggressive play can actually be good for kids. 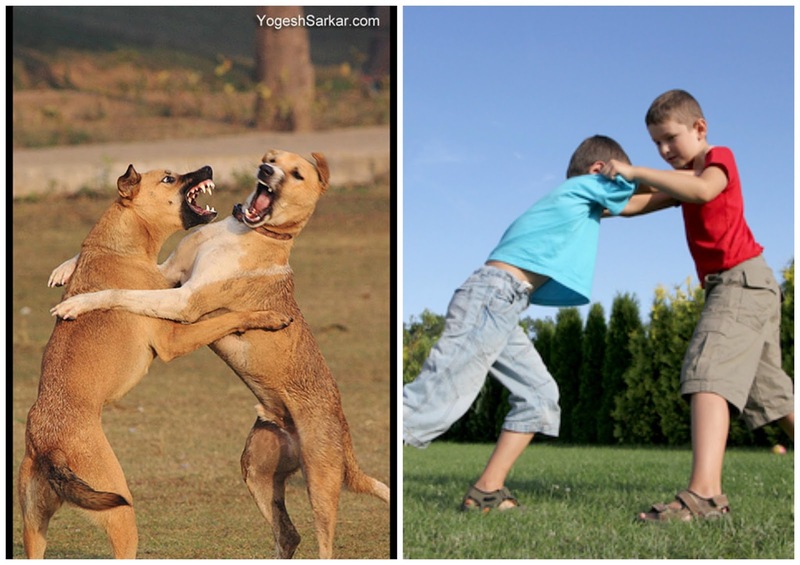 Some experts note that “children turn to play so that they can learn what they need to learn about aggression. We should become concerned about children's relationship to aggression only if they appear to be overly pre-occupied with aggression in their thoughts or actions outside the sphere of play.” So, aggressive play gives them a chance to experience and solve conflicts and to test their limits. It allows them to explore social boundaries, to practice and test their level of strength, and to determine social placement in the group. It also allows children to develop and practice restraint as they pretend to be aggressive. These are all skills I'd love my growing boys to develop. Third: contrary to our fears, aggressively play does not lead to violent or aggressive behavior as adults. There have been no studies linking aggressive play in early childhood to adult violent behavior. In fact, in a study of adults who had committed violent crimes, the researchers discovered that their childhoods had been marked not by violent play but, by a lack of play at all. And lastly, my being a woman might explain some of my squeamish reaction to this kind of play. I didn’t grow up rough-housing and don’t really “get” the fun aspect. I worry, like a lot of modern mothers, about raising overly aggressive boys, so I think it’s only responsible to stop fighting and teach more appropriate conflict resolution skills. Teachers, mostly women, largely feel the same. One study found that teachers interrupt boys fantasy play (which tends to be rougher) twice as often as girls fantasy play. However, the authors conclude that stopping this kind of play can inhibit boys’ opportunities to develop creativity, conversation and moral imagination, and probably does the boys a disservice. This kind of selective intervention might just be why more boys are currently struggling more in school. So, research completed, I think I now understand the value of rough-housing a bit more. I have to admit it’s not a total revelation. I’ve read those the books on the benefits of letting your kids get skinned knees and leaving them to solve their own conflicts. But I still want to balance this permissiveness with the need to prevent my boys from breaking a clavicle or growing up to be a jackass. I suppose this is the central tension of parenting – giving them both boundaries and freedom; roots and wings. I probably saw that on a nature-themed inspirational poster, but that doesn’t make it any less profound. I suppose for now, I’ll sit on my hands a bit when the monsters boys are clobbering each other. But only if their tails are wagging. My boys to a T. I'm pulling my hair out with worry that someone will get an eye poked out, meanwhile my husband joins in the fun. Doesn't help that I grew up with two sisters and am now a mom of two boys... You forgot to mention in your article how to get the grass and mud stains out of their clothes. Glad this resonated! Yeah, it seems like the dads have a greater comfort level with this kind of thing. And in terms of the grass and mud stains, I have NO idea. I have no washing machine but I have a woman do the laundry twice a week and she works minor miracles! This is a great post,thanks for sharing! It's hard for me to hold back the urge to say "stop fighting" - especially since my little guy doesn't have siblings. I don't want the fighting to be the only form of play he uses with other kids, but maybe I should watch a little longer before stepping in. Yeah, it's so hard to strike the right balance. And I think the more practice kids get in playing/fighting the better able they are to moderate the whole experience themselves. We've had an all boys playgroup during the 2 month break from school and at first the fighting was pretty nasty and incessant. But over time they've learned to solve their own problems better and also when the fighting is just for fun and when it more "for real." Thanks for stopping by and commenting Ace CB!! I have three boys and so this picture is my boys on a daily basis. Whether they are Ben-10, karate kid, Power Rangers or spies, they always look like they are going to beat each other up, which scares the pants off of me - especially since I grew up as an only child. However, they love to play this way and I love to see them happy. They also alternate this with other more "mellow" imaginary play, like building forts and pretending they are in a garage band. One rule we have in our house regarding the rough play, though is that if you are actively involved in rough play, you can't come crying to mommy unless you are bleeding. I know it sounds rough, but otherwise they play karate and then cry for a small, non-existent bump on the leg. I put it to them as a choice, and explain that they know the risks when they start playing rough. If they don't want to worry about bumps, they need to choose not to play rough. There is a theory that boys play rough because touching and hugging for boys in frowned upon. It is a way for them to get a human touch. I can understand your discomfort with the rough-housing. You were never one for chaotic play. I sometimes watch Andy and Zach and think, my house, with 3 children never had that much commotion - but boys will be boys. Do you remember I used to call it rapidly deteriorating situations? Great article! I have a 2.5 year old son and another on the way, and this was very enlightening to my future. I definitely think stopping them (when it's all fun and games) is a disservice to them. Let them play! And to be competitive with other producers, the price of the food dictates what the foundation or the primary ingredient is; and it is not meat.